The Association of the Holy Family is a practical expression of the intention of Blessed Mary of Jesus Good Shepherd to involve the laity in the Mission of Nazareth. 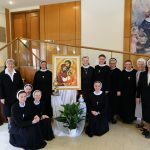 It involves mutual cooperation and spiritual exchange between the Congregation of the Sisters of the Holy Family of Nazareth and members of the Association. The Associates are presented with an opportunity for solid formation, a deepening of their personal relationship with God, and involvement in the apostolic mission through participation in the life, spirituality and mission of the Congregation. The Association functions in every Province of the Congregation. Families who desire to share the mission of the Nazareth Sisters are invited to become members of the Association. Members actively participate in formation and apostolate of the Association. Children of the members do not belong to the Association but form a group called Children of Nazareth. Official admission into the Association takes place after a period of suitable preparation from between one to two years. Associates undertake various apostolic involvements. The first task of a member is to give witness to Christian family values within one’s own family, in the work place, and in society at large. This is accomplished by the associate’s efforts to strengthen family bonds following the example of the Holy Family of Nazareth. Associates have a special veneration to the Holy Family, imitating its virtues in their personal and family life, and spreading devotion to the Holy Family. Apostolic involvement finds its expression in daily prayer in unity with the Congregation of the Sisters of the Holy Family of Nazareth for all families of the world. Associates pray also for the Church and the Holy Father, and for the Congregation and its Mission of spreading the Kingdom of God’s Love.